Bringing Down a Dictator: This film by Steve York presents the story of OTPOR!, the movement that, through nonviolent action and protest, brought down Serbia’s dictator, Slobodan Milosevic. Srdja Popovic, one of the leaders of OTPOR, founded CANVAS. Watch it here, for free. A Force More Powerful: This documentary explores how popular movements battled entrenched regimes and military forces with unconventional weapons like boycotts, strikes, and demonstrations. Acts of civil resistance helped subvert the operations of government, and direct intervention in the form of sit-ins, nonviolent sabotage, and blockades frustrated many rulers’ efforts to suppress people. Visit the website here. The Yes Men Fix the World: Troublemaking duo Andy Bichlbaum and Mike Bonanno, posing as their industrious alter-egos, expose the people profiting from Hurricane Katrina, the faces behind the environmental disaster in Bhopal, and other shocking events. Watch it here. Burma VJ: Oscar-nominated and honored with over 50 international awards, this film on Burma’s secret video reporters is one of the most prolific political documentaries in recent years. Using smuggled footage, this documentary tells the story of the 2007 protests in Burma by thousands of monks. Read about it here. Nadine Bloch – The Arts of Protest: Creative Cultural Resistance (webinar): This webinar takes a critical look at Creative Cultural Resistance: the broad use of arts, literature, and traditional practices in the service of protest and political and social actions. Join Nadine Bloch, artist, nonviolent practitioner and facilitator, in teasing out the strategic powers of cultural resistance. Through compelling examples, this talk covers the immense diversity of methodologies that have been employed in resistance, from 2-D and 3-D arts, to sound/music and theater/movement arts. Watch it here. Insight with Gene Sharp – From Dictatorship to Democracy: More and more, people are taking to the streets across the world, as in the Middle East and North Africa, to demand an end to tyranny and oppression. As a result, unprecedented regime change has taken place. The extent to which the protesters were influenced by the 83-year-old political scientist, Dr. Gene Sharp, is unknown. His comments are a staple of the process, however, and his book From Dictatorship to Democracy has previously been utilized as a blueprint by democratic movements from Serbia, to the Ukraine, Guatemala to Indonesia, in their fight to overthrow oppressive regimes. Watch it here. Everyday Rebellion, The Art of Change: Everyday Rebellion is a cross-media documentary about creative forms of nonviolent protest and civil disobedience worldwide. Everyday Rebellion is a tribute to the creativity of the nonviolent resistance. The project studies the consequences of a modern and rapidly changing society where new forms of protest to challenge the power of dictatorships and sometimes also global corporations are invented everyday. 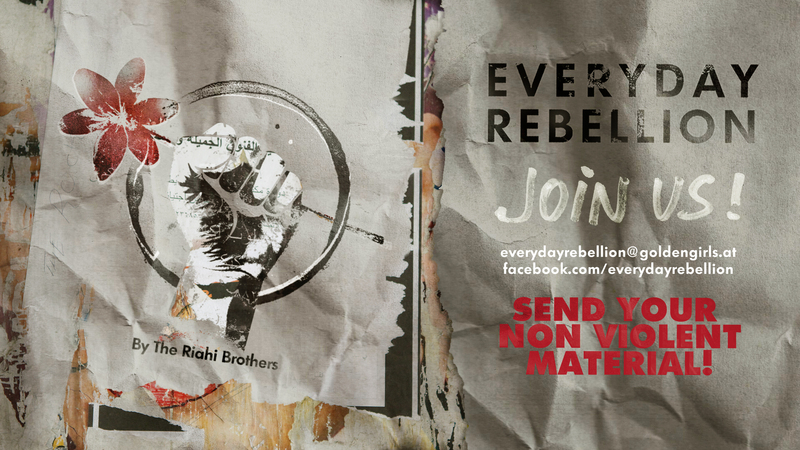 Everyday Rebellion wants to give voice to all those who decide not to use violence to try changing a violent system. Because, as Ghandi said: “First they ignore you, then they laugh at you, then they fight you, then you win.” Visit their website here. Erica Chenoweth – Managing Repression: Erica Chenoweth (born April 22, 1980) is an American political scientist as well as a faculty member and Ph.D. program co-director at the University of Denver’s Josef Korbel School of International Studies. Chenoweth is also the Director of the university’s Program on Terrorism and Insurgency Research and a researcher at the Peace Research Institute Oslo (PRIO). Within the international relations community, she is known for her work on civil resistance movements and political violence. Watch it here.